It has been about 6 months since I started my YouTube channel and this blog. It is hard work but I've had a lot of fun. The best part is I have met a lot of interesting people along the way. People that are encouraging, uplifting and just as passionate about DIY as I am, if not more. I receive a fair amount of emails asking questions ranging from how old I am to why I bought the brands of tools that I did. I really want to get into woodworking, build nice things and maybe if i turn out to be good, start a small side business. Do you have any suggestions or tips on what route I should take? I like to learn from people that are already doing what I want to do so I can prevent mistakes that you and maybe others have encountered. Wow! I could go a hundred different routes with this one. I find it fascinating the different motivations people have for wanting to start woodworking. All of them valid, in my opinion. However, I can only answer from one perspective. My own. My first recommendation would be to not go into it with the thought of a side business. When people get in there cars to go to work in the morning, they just want to get to their destination. They are incapable of enjoying the ride because where they have to go is the only thing on their minds. When I first started out, one of my biggest frustrations was that I hadn't arrived yet. I wanted the project I was working on to be completed. I thought woodworking was about using power tools and cutting lumber. The day I decided to slow down and want nothing other than a relaxing day in the shop; that is the day my projects started to look better than I ever thought possible. The learning curve is steep in woodworking. It takes time and patients to find techniques that work for you. The day I stopped focusing on the end product and started enjoying the building process is the day I realized the destination was just the icing on the cake. If you introduce the thought of a side business at the very beginning, it might be that much harder to enjoy the trip instead of focusing on the destination. There is no doubt that a big part of woodworking and DIY projects in general has to do with tools. A big can of worms awaits on this trail that I will try not to open. I hear some people say they only buy a certain brand of tools because everything else is junk. New people will hear a statement like this, see the brand being spoken of, then see the price of that brand and experience a feeling of defeat because they can't afford it. I have seen some people not even start because of this. Others power thru this and buy what they perceive to be an inferior brand and feel as though their woodworking will never be as good. I think sometimes woodworkers like to brag and show off their expensive tools as if they were a shiny new sports car. Well guess what, that sports car can break down just like any other car only it costs more to fix it. Each tool that comes into your shop should serve a purpose not your ego. I am not loyal to any one brand and I never buy a tool that I can not pick up and put in my hands at a bricks and mortar store. Why? Because different tools and brands of tools will feel different to each individual. Pick up those tools and use them if you can at the store. Sometimes stores will have displays set up for that reason. I went to Home Depot once and they had a Milwaukee Impact driver display with screws in a board next to it. The sound of an impact driver echoed thru the whole store as I kicked the tires. When I finished I realized everyone in the immediate vicinity had turned in my direction and was staring. A few heads popped out from the end of aisles half way across the store presumably to see what the noise was. I just walked over to the Ridgid display gave a nod to someone who made eye contact and gave everyone the next show. I have a Black and Decker drill/driver and a Ridgid drill/driver. I like each one for different reasons. I bought the Black and Decker Drill and two batteries off craigslist for $20... 8 years ago. The Ridgid came as a set with a couple different tools and batteries. Someone gave me $100 for my birthday. I had $75 in credit card rewards and I ponied up the rest by selling some stuff of my own on craigslist. Why did I buy the Black and Decker? I got a deal. One that had low risk and after 8 years, I would say has yielded lots of reward. Why did I spring for the Ridgid set? Lifetime service agreement. What is important to you now, may not be later. It may not be a priority to anyone else at anytime. Spend some time to find out what is important and take what everyone else says with a grain of salt. Of course no discussion on tools would be complete without the obligatory "tools to start with" list. This is a hard one for me because when I see those lists for the 5 or 10 essential tools for the new woodworker, I cringe. I will just pick the one that get my gander the most. The jigsaw. Of course these issues may seem elementary to a seasoned veteran of such tools. Then again the solutions are only elementary if you know them. There in lies the rub. If you don't know what questions to ask, how can you then be expected to ask them. Lists of essential tools for the beginning woodworker are written by people looking back and answering the "what if" question. They then fail to take into account the expansive knowledge base they have acquired through the years and take for granted. So we have what you might call a "catch 22". The tools that are the cheapest and most well suited for the beginner on tight budgets are also those least well equipped to handle the intricacies of those tools. Which came first, the chicken or the egg. So what tools do I recommend? In my opinion, don't try to short cut this. The fact of the matter is that a table saw is often times the focal point of a shop. Anyone who does woodworking on any type of regular basis has one. It doesn't need to be an expensive one but get one in your shop. I can find them locally for around $50 used. It doesn't have to be cordless but a drill is a must. I'm not sure I need to say anything else about that. I know, I know....zzzzzzzzzzz. Nobody likes sanding, I get it. Get one. My neighbor had a garage sail not long ago and I found a 1/4 sheet sander for $10. Ouch! Pocket hole jigs are to woodworking as scooters are to motorcycling. They are fun to ride but you don't want any of your friends to see you on one. One of the hardest things to master early on is the art of joinery. A pocket hole jig can be used as a crutch at first while you experiment with and learn the ins and outs of other joinery methods. These would be hard to find used but a no frills version can be had for about $20 at a home improvement store. I bought a flush cut saw for $9. I also learned to sharpen the teeth. Finger joints and dovetails I have only ever cut by hand. Don't be afraid to go low tech, it can only make you better at your craft. So lets do the tally. I think anyone who brings these tools into there shop will find out pretty quick whether or not they like this thing called woodworking. If you do, then other tools are sure to follow. If not, then you haven't wasted your hard earned money on a bunch of tools that will only serve to frustrate and antagonize you. Finally, I recommend you learn to work within the limitations of your tools. At first look for projects that require minimal cuts and shaping. You can do a lot by adding layers to a project to give it a more complex look. A single piece of plywood with a few pieces of trim glued to the front makes for a pretty nice looking cabinet door after it is painted. After you master the art of a sink full of dishes then you can move on to the whole house. 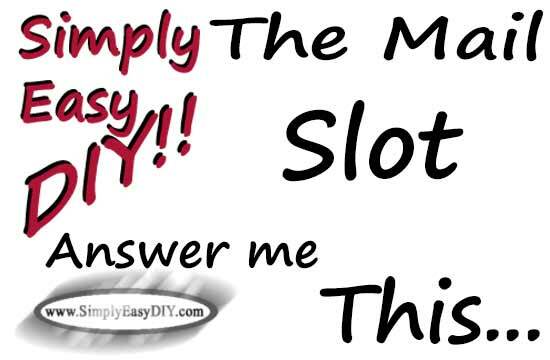 As always if you have any questions, comments or anything you would like me to cover in a future edition of the mail slot, you can shoot me an email at simplyeasydiy@gmail.com. You can visit my contact page or find me on facebook and write on my wall. Until then. I have read your article post. very nice. thank's your advice. Really this post is so helpful for us. thanks for the efforts. Thank's for sharing. Its always great to find good honest practical content.